Prions: spread through brain eating, but not really zombie making - symptoms of prion-based diseases do include cognitive, memory and balance and movement problems, but infected people don't usually seek fresh brains to eat. Are you prepared for a zombie attack? 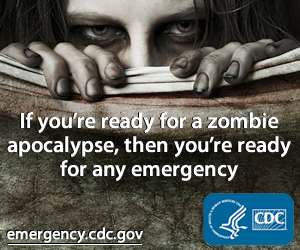 Be sure to check out the CDC's zombie apocalypse preparedness tips so that you are ready! Is it more likely that the (hypothetical) moons around planets in distant solar systems may be more likely to harbor life than the planets themselves? Perhaps. Seems like science fiction has this option covered, with (fictional) life teeming on moons as close as Jupiter's Europa, and as far away as Pandora and the moons of Endor. Want to live to be 100? Don't go to college! Of course that's a bit silly: the infographic in the article illustrates out one of the foibles of statistics. A correlation between two things - attending college and shorter lifespan - doesn't necessarily mean the one causes the other, especially considering that 100-year-olds today would have attended college in the 1930s. On the other hand, eating nuts is correlated with longer life - it certainly doesn't hurt to do that and it's tasty! If you want real science fictional thinking, the article also quotes Ray Kurzweil as saying that if you can keep yourself alive for the next 15-20 years, you will have lived long enough for biotechnology to reprogram your genes away from disease and aging. Considering that we haven't yet developed a reliable method for editing human genes, let alone determined whether "longer life" genes in humans exist or how they function, I figure this is less plausible than my college education shortening my life span.